The signs went up less than two days after News 4 New York's I-Team's first reported on wrong-way crash dangers on the highway. Pei-Sze Cheng reports. 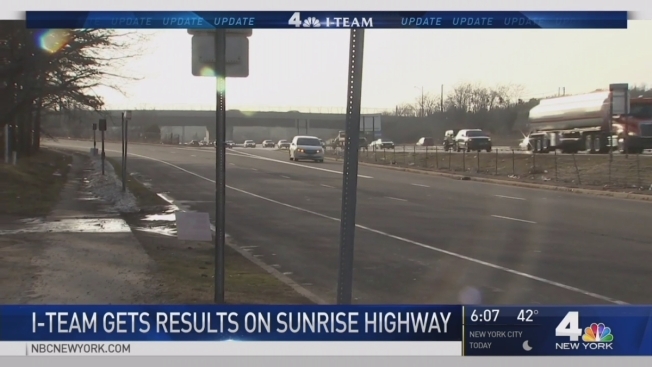 The Department of Transportation has made good on its promise to install new traffic warning signs on the Sunrise Highway after the I-Team reported that the highway with a deadly history was missing critical mandated signage. Less than 48 hours after the I-Team report aired, the DOT says it's installed 229 "Wrong Way" and "Do Not Enter" signs at 30 ramps on the Sunrise Highway, which has seen more than 20 cases of wrong-way driving since 2010 -- including two fatal crashes that killed three people in 2016. The I-Team's cameras captured DOT crews at work as they installed the new signs Thursday. People who live along Sunrise Highway say the lack of signage has been a problem. They welcomed the quick action. "I'm happy they did," said Al Rose of Islip. "I think there are other places on Sunrise where signs should go up." State Sen. Phil Boyle (R-Suffolk County), who contacted the DOT after viewing the I-Team's report, said he's stunned by the state's quick response. "It was that important -- there were lives on the line, and we didn't want another tragedy," he said. "I have to commend the I-Team because in my lifetime of government service, this is the fastest governmental response to a problem I've ever seen in my life," he said. Signs are just the beginning: the DOT says they're investigating other technologies that go a long way to prevent wrong-way driving.